1. What are degenerative diseases? Degenerative diseases are common non-infectious diseases whose incidences increase with age. 2. What are risk factors for diseases? Risk factors for a disease are everything that contributes to an increased risk of the disease appearing. For example, for most cardiovascular diseases, tobacco smoking and diabetes mellitus are both important risk factors; for some cancers having a genetic cause, a positive family history is a risk factor, etc. 3. What are the main human degenerative diseases? The main human degenerative diseases are divided into three groups: cardiovascular diseases, neoplastic diseases and degenerative diseases of the nervous system. The main cardiovascular diseases are hypertension, cardiopathies, including coronary disease and myocardial infarction, and cerebrovascular accidents (CVAs, or strokes). Neoplasms are benign tumors and cancers. The main degenerative diseases of the nervous system are Alzheimer's disease and Parkinson's disease. Hypertension is a disease in which arterial blood pressure is abnormally high, during systole or during diastole. Hypertension, or high blood pressure, is a condition that must be diagnosed and treated, since it produces irreversible injuries to arteries and, later, it causes other severe diseases in organs such as the heart, brain, kidneys, retina, etc. 5. What are the main risk factors for hypertension? The main risks factors for hypertension are tobacco smoking, stress, obesity, a sedentary lifestyle and alcoholism. 6. What is the relationship between the maximum and the minimum blood pressure during the phenomena of systole and diastole? The maximum blood pressure is the pressure on the wall of arteries during systole, that is, when the heart is pumping blood to arterial vessels. The minimum blood pressure is the pressure on the wall of arteries during diastole, that is, when the heart ventricles are relaxing and filling with blood. 7. What are the main degenerative diseases of the heart? The main degenerative diseases of the heart are heart failure, arrhythmias, valvular heart diseases, coronary insufficiency and myocardial infarction. 8. What is coronary disease? Coronary disease, or coronary insufficiency, is a disease in which there is total or partial obstruction of one or more of the arteries that irrigate the heart musculature; that is, obstruction of the coronary arteries. The disease is formed by the slow and gradual formation of atheroma plaques inside coronary arteries. The fatty plaques grow and block the flow of blood, a process known as atherosclerosis (not to be confused with arteriosclerosis, which is the hardening of the arteries generally caused by chronic high blood pressure). The main risk factors for coronary disease are tobacco smoking, diabetes mellitus, hypertension, hypercholesterolemia (a high level of bad cholesterol and low level of good cholesterol), stress, alcoholism and a sedentary lifestyle. Coronary disease may manifest into one of two ways, angina pectoris or myocardial infarction. If the arterial obstruction is not complete and extensive, the patient often feels chest pain (angina pectoris), mainly when performing physical exercise or in any situation when the heart needs more oxygen. If the obstruction of one or more coronary arteries is complete or blood cannot irrigate some regions of the heart muscle (myocardium), infarction occurs and the muscle cells of the affected area die. 9. What is myocardial infarction (a heart attack)? Myocardial infarction, or heart attack, is the condition in which an area of heart tissue or the entire heart muscle dies by hypoxia due to lack of blood irrigation. Myocardial infarction is a severe disease since the heart can fail depending on the extent of its damage, becoming unable to pump blood to the lungs or to the body, or even ceasing to beat (causing death). The main cause of myocardial infarction is coronary obstruction, the blockage of the arteries that carry arterial blood to the heart muscle. Other events such as hemodynamic shock (circulation stoppage due to large hemorrhages, for example) can also cause myocardial infarction. 10. What is coronary bypass graft? A coronary artery bypass graft is a type of surgical myocardial revascularization; or rather, a way to provide blood to a myocardium whose blood supply is impaired or blocked due to coronary disease. In this surgical treatment of coronary disease, one or more blood vessel grafts taken from other parts of the body are used to join the obstructed artery (in a region after the obstruction) with the aorta or another healthy coronary artery, thus reestablishing blood flow to the myocardium. Often, the blood vessel grafts are done with part of the saphenous vein in the leg or of mammary artery in the chest, or even the radial artery in the forearm. 11. What are cerebrovascular accidents? A cerebrovascular accident (CVA), also known as a stroke, is the generic name given to infarction (tissue and cellular death by hypoxia) of areas of the brain due to vascular obstruction or hemorrhages. CVAs are divided into ischemic and hemorrhagic. In ischemic CVAs, the blockage of arteries that carry blood to the brain occurs; its cause is generally atherosclerosis (atheroma formation) of these vessels. In hemorrhagic CVAs, one or more blood vessels in the brain ruptures and leaks blood, increasing intracranial pressure and therefore interrupting blood flow in some areas of the brain. The severity of the stroke depends on the function performed by the affected area of the brain, for example, motor functions, visual functions, vegetative functions, etc., and on the size of the involved area. The main risk factors for cerebrovascular accidents are hypertension, hypercholesterolemia, tobacco smoking and old age. Neoplasia is any abnormal and uncontrolled proliferation of cells of in an organism. Neoplasias can be benign or malignant. Benign neoplasias are when cell proliferation is limited to a given site of the body and the neoplastic cells do not spread to other close or distant regions through circulation. Malignant neoplasias are when neoplastic cells disseminate over a distance to other sites and organs of the body, a process called metastasis, where they continue to proliferate. Malignant neoplasias injure tissues and, if not eradicated, they are fatal. A benign neoplasm can also be deadly when it forms a tumor that grows and compresses vital organs. 13. How different are the concepts of neoplasia, tumors and cancer? Not every tumor is neoplastic and not every neoplasia creates a tumor. A tumor is the generic name given to the abnormal increase in mass or volume of any area of the body (for example, the enlarged tonsils during throat infection are a type of tumor, any inflammation creating a swelled area is characteristic of a tumor, etc.). Neoplasias can form tumors, some of them very large, through the accumulation of neoplastic cells in the region where the neoplasia began or in distant areas. Cancer is a synonym for malignant neoplasia. Cancers are malignant neoplasias, that is, the abnormal and uncontrolled proliferation of cells that can spread to other sites of the body. Cancer spreading over distances usually occurs through blood or lymphatic vessels. 15. How do neoplasias appear? Neoplasias appear due to DNA mutations in genes that regulate cellular proliferation, thus making the cell lose its capacity to control and limit its division by mitosis. The cell then divides continuously and uncontrollably and this defect is transmitted to its daughter cells. Carcinogens are factors capable of producing neoplasms. Any mutagen, a substance that can induce DNA mutation, is a potential carcinogen. Examples of carcinogens are radiation, nitrous acid, many substances inhaled through tobacco smoking and the human papilloma virus (HPV). 17. How do the cells of neoplastic tumors obtain oxygen and nutrients and release waste? In neoplastic tumors, a phenomenon called angiogenesis occurs. Angiogenesis is the formation of new blood vessels. Neoplastic cells induce the formation of new blood vessels to irrigate and drain neoplastic tissue. Angiogenesis is important because tumor growth depends on it. A lot of research on cancer has tried to discover natural and synthetic substances to inhibit angiogenesis. 18. What are the main types of cancer that affect humans? Excluding skin cancer, which is the most easily detected type and therefore the type with the largest number of registered cases, the main types of cancer in men are prostate cancer, lung cancer, and stomach cancer. In women, breast cancer, colon and rectal cancer and lung cancer have high rates. Other common cancers are ovarian cancer, pancreatic cancer, liver cancer, esophageal cancer, brain cancer and leukemia and lymphoma (blood cancers). Epithelial cancers, of the skin as well as of the internal organs, are more common because epithelial tissues are more exposed to carcinogens. The proportional incidence of the many types of cancer varies according to the population studied. 19. What is the main risk factor for lung cancer? The main risk factor for lung cancer is tobacco smoking. The large number of cases of this type of cancer is due to the large number of smokers worldwide. 20. What is the main risk factor for skin cancer? The main risk factor for skin cancer is the exposure of the skin to sun without protection against ultraviolet radiation (a potential carcinogen). 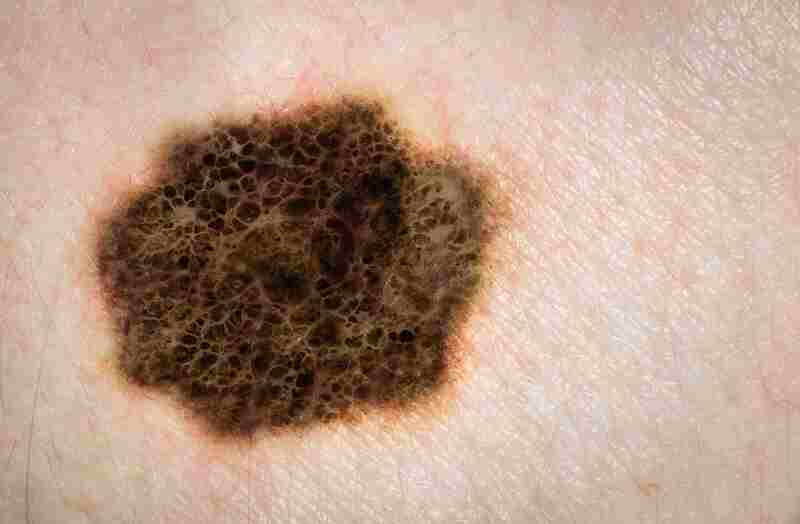 The most lethal skin cancer is melanoma. 21. How is cancer usually treated? If the cancer is in its initial stage, treatment is often done by the surgical removal of neoplastic tissue. Cancers that have already spread are often treated with radiation (radiotherapy) and anti-mitotic drugs (chemotherapy). 22. What are the main degenerative diseases of the nervous system? The main degenerative diseases of the nervous system are Alzheimer’s disease and Parkinson’s disease. Degenerative diseases of the nervous system are caused by progressive tissue degradation or the loss of neurons in some regions of the nervous system. 23. What is Alzheimer’s disease? Alzheimer’s disease is a degenerative disease of the central nervous system in which the patient develops progressive dementia and an alteration of mental functions. 24. What is Parkinson’s disease?